Today, the Storm Prediction Center has issued a Day 2 High Risk for only the second time in it’s history. When was the previous one? 06 April 2006 for the vicinity affected by the 27 April 2011 outbreak. 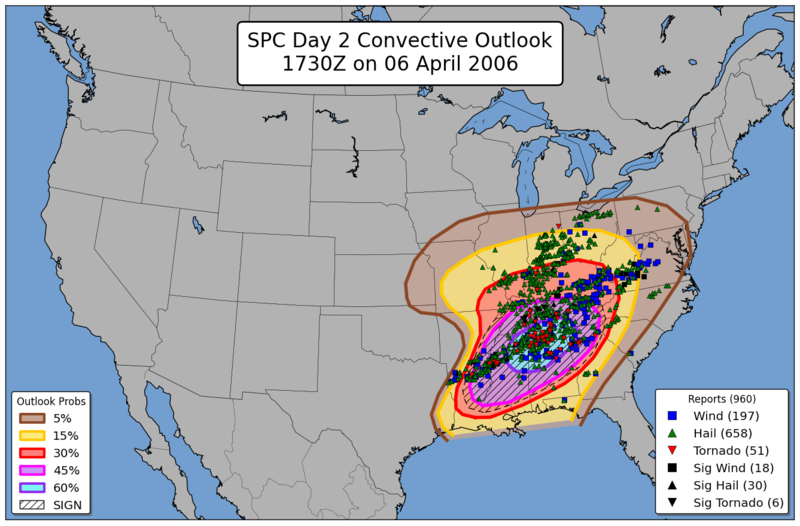 For those interested, the SPC DID NOT issue a Day 2 High Risk for the 27 April 2011 outbreak. So, since the SPC did not issue a Day 2 High Risk for 27 April 2011, does this mean that the SPC is expecting an even bigger severe weather event across the central US tomorrow? Not necessarily. On 26 April 2011, most meteorologists knew a significant tornado outbreak was going to occur the following day. In fact, most everyone I know expected the SPC Day 1 outlook to have a High Risk on 27 April 2011. The reason the 26 April 2011 SPC Day 2 outlook did not include a High Risk is because there were lingering uncertainties as to where the greatest concentration of severe weather would occur. So, even though today’s Day 2 outlook contains a High Risk, it does not necessarily mean that SPC is expecting an even bigger outbreak than 27 April 2011 tomorrow. It just means that SPC has a higher confidence on the region to be affected.